Since being asked to document the rehabilitation of the cradle of Chinese civilization in the Loess Plateau in 1995, the Environmental Education Media Project (EEMP) team has witnessed a paradigm shift in human understanding and behavior, that has led to the re-vegetation of large areas of degraded land. This regeneration has begun to return ecosystem function that had been lost over a broad area, and simultaneously lifted millions from poverty. The improvement in the ecological conditions has stimulated local economic growth and altered the development trajectory, from one of human activity leading to environmental collapse, toward a sustainable future. The psychology of the local people has also changed, from resignation and despair, to hopeful expectation of a better life. This is being done on a scale that is large enough to show that human impact on ecosystems does not have to be negative. As we continue to study this phenomenon we have begun to extract principles and definitions, to try to better understand what we are witnessing. The more we learn about this, the clearer it is, this knowledge is profoundly relevant today, in that it helps to address many of the world’s most serious problems, including climate change. In order to test our understanding we have presented to scientific bodies and in development forums. So far, scientific and development groups making their own observations through their work have repeatedly confirmed our findings. We also went to several countries in Africa to see if the insights from China could help change the downward spiral that has plagued that continent for so long. What we learned in Africa, reinforced this thesis and is helping to stimulate new policies and actions that could lead to the recovery of ecosystem health in many critical areas and for many break the cycle of poverty and ecological destruction which has continued for generations. For the global environment, all indicators are pointing toward imminent crisis. It’s becoming very hard to ignore the warning signals. “Over the past 50 years, humans have changed ecosystems more rapidly and extensively than in any comparable period of time in human history, largely to meet rapidly growing demands for food, fresh water, timber, fiber and fuel.” (The United Nations Millennium Assessment). “Climate change presents a unique challenge for economics: it is the greatest and widest-ranging market failure ever seen. The economic analysis must therefore be global, deal with long time horizons, have the economics of risk and uncertainty at centre stage, and examine the possibility of major, non-marginal change.” (Independent scientific review led by Sir Nicolas Stern in the UK). “Warming of the climate system is unequivocal, as is now evident from observations of increases in global average air and ocean temperatures, widespread melting of snow and ice, and rising global mean sea level.” (The Intergovernmental Panel on Climate Change (IPCC) reporting to the World Meteorological Organization and the United Nations Environment Programme). There is much more evidence in the melting Siberian tundra, the collapsing Arctic and Antarctic ice shelves, growing deserts worldwide, waves of extinctions, loss of biodiversity, loss of fertility and productivity, fresh water disruptions, poverty, the disparity between the haves and the have-nots, and of course Carbon disequilibrium. Alarm bells seem to be constantly going off, but we mustn’t be overly fascinated by the alarms and fail to ask the essential question. What are we going to do? Generally speaking, history tends to remember human accomplishments and struggles. Perhaps this is inevitable, since after all, it is human beings who are writing the history books. But the great cities, the vibrant economies, the wars, the passions, all eventually recede into legend and we are left with the ecological results. Few remember the causes but no one can ignore the consequences, they are all around us. So what is more important? This suggests that it is necessary to understand history in terms of what happened to non-human geological, biological and meteorological systems, as well as what happened to the people. To really grasp what has happened it is necessary also to analyze it from a systems perspective rather than looking at individual impacts in isolation. In the Loess Plateau, we initially noted that while a magnificent civilization emerged by extracting the vital wealth of the earth, the land ultimately was fundamentally ecologically degraded by exploitation. In order to fully understand what this meant, we began to study the issue. In short, what we found was that five basic ecosystem functions vital to life had been disrupted. These ecosystem functions can be broadly defined as: biodiversity, soil stability, natural fertility, hydrological regulation and Carbon sequestration. It was also clear that the loss of all of these ecosystem functions was interrelated. The removal of the vegetation cover had led to the loss of soil stability. As well, the loss of vegetation, reduced organic matter, and the loss of soil stability, further exacerbated the loss, leading to reduced fertility and productivity. Without the vegetation and sufficient organic matter in the soil, natural infiltration and absorption of rainfall was disrupted, leading to continuous flooding in the rainy season, followed by drought through the rest of the year. Finally loss of vegetation cover and organic matter in the soil, meant that the ability to sequester Carbon had been lost over a broad area. We further found that the people of the Plateau had in a sense devolved. Their fabled past gave way to a cycle of poverty and ecologic destruction. So while the distant memory of greatness remained, the reality for over a thousand years was one of continued degradation, hardship, suffering, famine and all too often, early death. The Plateau has revealed additional knowledge. It has shown that degraded ecosystems have impacts that go far beyond local ones. In the Loess Plateau this manifested itself as massive sedimentation of the Yellow River. At the high point of erosion from the Plateau, well over one and one half billion tons of soil eroded into the River each year, clogging infrastructure and requiring enormous expense to contain. Gigantic dust storms also originating in this area, wreak havoc as they sweep through surrounding parts of China, beyond to neighboring countries and finally around the world, contributing to the greenhouse effect by altering the transmission of light and heat through the atmosphere. This link between degraded ecosystems in remote parts of the world and the global environment is another profound lesson of the loess plateau. The history of the Loess Plateau shows plainly the link between the flourishing of a civilization through exploitation of ecological benefits derived from nature, and the loss of ecosystem function and the end of a civilization. This has been repeatedly demonstrated around the world. The Sumerians, the Mayan, the Easter Islanders and many others have all illustrated this through their initial development and eventual decline of their civilizations. While it can be fascinating to investigate what made ancient civilizations collapse, it is what the Loess Plateau has most recently revealed that is astounding. On the Loess Plateau we have witnessed and documented strong, visible and measurable evidence that it is possible to rehabilitate large-scale damaged ecosystems including returning ecosystem function that had been lost over a large area. This is the crucial knowledge that determines whether civilizations fail because their ecosystems collapse or whether they survive because they have learned to ensure that their ecosystems are sustainable. Confronted with a fundamentally degraded ecosystem it takes clear far-sighted vision to imagine that it can be repaired. Few in the beginning really believed that it was possible to rapidly restore ecosystem function over a broad area. Most who believed it was possible, felt that it would take decades before ecosystem function would come back. Others felt that the whole task was impossible. Yet in the face of doubt and disbelief in the possibility of rehabilitation, the project went ahead. Within a decade there were visible and measurable results showing vegetation cover returning over a large area and with it renewed fertility, productivity, economic and social improvement, and increased ecosystem function across the board. There is even significant and measurable improvement in Carbon sequestration, crucial to lower human impact on Climate Change. This is exactly what the world needs now, a way to reverse generations of ecological degradation and to reestablish a sustainable relationship between human beings and the Earth. Attention must be paid. This change essentially reversed four hundred generations of negative ecologic behavior and changed the trajectory of the development curve from collapse toward sustainability. This means that the point of intervention is the shift to a new paradigm in human understanding and behavior that determines whether civilizations survive or fail. This has profound implications for everyone. Unsustainable Agricultural Practices Must End: In the Loess Plateau as in many other parts of the world this is first and foremost cutting down of trees. Once the trees are gone the people tried planting on the sides of steep slopes and finally they free ranged goats and sheep until the land was virtually denuded. These practices have been banned. But it is not possible to just to tell people who are living at near subsistence that they must stop doing the only things they know how to do to make a living. Sustainable alternatives were devised, training was provided, and a significant investment was made. This allowed the people to transition to a new sustainable way of life. Ecological and Economic Land Must be Differentiated and Designated: The differentiation and designation of ecological and economic land is emerging as an important principle. It is absolutely essential that in order to have functional ecosystems, at least some of the land must be allowed to provide these essential ecosystem functions. If, as happened in the Loess Plateau, people exploit every inch of land for economic return then the outcome is already determined. We mustn’t stand about shaking our heads in confusion when ecosystems collapse. It is completely understandable, measurable and even predictable. But just as with degradation, if sufficient land is designated as ecological it is completely understandable, measurable and predictable the extent of rehabilitation. Given the fact that we require ecosystem function for survival, it follows that we need designated ecological land. When we understand this and apply it, we have a model that will ensure sustainable, functional, and healthy ecosystems for future generations. And conversely if we fail to understand this, we are faced with growing deserts, more and more poor people and the prospect of the failure of civilization. In trying to determine the difference between economic and ecological land it was necessary to determine criteria. For the Loess Plateau, the authorities found that any slope over 25 degrees was unsuitable for agriculture because whatever you could produce there would be worth much less than the ecosystem functions that you lost. This also requires recognizing the value of ecosystems and factoring them into a new economic model. This new economic model is very important because it contains the theoretic basis of a future sustainable human society. There are other principles and the exact actions taken by the Chinese in the Loess Plateau such as banning tree cutting, planting of crops on steep slopes, free ranging of goats and sheep, providing training in new alternative livelihoods, legal frameworks for long term land tenure to farmers, sufficient investment, etc. that have been explained elsewhere. For additional information please visit www.earthshope.org or www.eempc.org. In every continent there are examples of large-scale ecosystems that have been fundamentally degraded by human activity, even to the point of collapse. But evidence in the Loess Plateau and elsewhere proves that it is not necessary for humans to continue to degrade the environment. In fact, in order to survive, human beings have to reverse this trend. But if it isn’t necessary to cause degradation, then why does it continue? One reason can be seen in economic evaluation, the relative values given to various things which benefit us. As long as commodities are given financial value but ecosystem functions and the benefits they provide are not given a value, then a goat devastating the vegetation, or a bean or a banana forced from the side of a mountain, is considered more valuable, than a river flowing naturally down out of the mountains and through the plain, or a forest quietly ensuring biological diversity, fertility, natural infiltration and absorption of water, Carbon sequestration and oxygen. As soon as any conceivable value for natural ecosystem functions necessary for life is factored in, it is impossible to consider the bean or banana as anywhere near as valuable. Another issue is the difference between individual benefit and collective benefit. The destruction and rehabilitation of the Loess Plateau is helping to show that individuals benefit from collective understanding and action that leads to restoration and conservation and that both individuals and the society suffer when ecosystems are degraded. This understanding seems to be a required part of the new paradigm. As long as individuals selfishly serve themselves it will be difficult or impossible to restore large-scale damaged ecosystems. Ironically, their selfish behavior can only provide short-term benefits for them as they will ultimately have to face the consequences with everyone else when ecosystems collapse. The reality is that we have failed to understand the economics of ecosystem logic. Repeatedly through history human beings were shocked to see that Nature would eventually settle accounts for wasteful and destructive behavior. Again and again it has been proven that we all pay and we either pay now or we will most definitely have to pay later. Significantly, the benefits of intact ecosystems are not limited to the local people, everyone on Earth benefits, this suggests that the local people should not have to bear the responsibility of restoring and maintaining these ecosystems alone. If you consider whether poor people living near subsistence have the scientific understanding, technical capacity, management skills or capital to successfully rehabilitate large-scale degraded ecosystems that have suffered for generations, the answer is probably no or they would have already done it. If you consider that the interests of these people and the interests of people everywhere are the same and you ask the same question, you get a much different answer. There is no doubt that the world possesses the scientific understanding, technical capacity, management capacity and capital to restore ecosystem health to many areas that are now degraded. When considered in this light it is possible to see that everyone benefits from functional ecosystems wherever they are and that the restoration, protection, and conservation of the Earth’s resources are not the responsibility of some but the responsibility of us all. Whether or not to rehabilitate all degraded land on earth is a choice that we will either make consciously or we will have made by inaction. If we fail to act, then the outcome is already known as we experience the continuing loss of biodiversity, increasing deserts, more and more poverty, shortages of fresh water and ultimately massive climate change caused by Carbon disequilibrium. Each of us must now make a choice. What will you decide? The rehabilitation of the Loess Plateau was not free and investment is most definitely required in integrated poverty eradication and large-scale ecosystem rehabilitation. Five hundred million dollars was invested in the Loess Plateau rehabilitation over 10 years in an active project area of 35,000 square kilometers. Another benefit of the project planning has been a more accurate type of economic calculation. Instead of calculating only the cost of rehabilitation, the costs of rehabilitation were calculated in comparison to the cost of mitigating the silt deposition downstream. In comparison with the infrastructure replacement and mitigation costs downstream for the high level of silt, the rehabilitation proved to be vastly less expensive. When you then realize that this equation is favorable with only a single factor, silt caused by erosion, you can begin to imagine what the real value of rehabilitation may be when the value of biodiversity, natural fertility, hydrological regulation and Carbon sequestration are factored in. In China, where there is growing disparity between coastal and inland opportunity and income, the Loess Plateau Watershed Rehabilitation is further supporting the thesis of wide responsibility and investment for rehabilitation from non-local sources. This is a strong theoretic tenet of a “Socialist Market Economy” and in this case it is possible to see the strength and possibility this represents. In Autumn 2006, with the support of British Department for International Development (DFID), the British Department of Environment, Food and Rural Affairs (DEFRA), the World Bank, Rothamsted Research Institute and the Jane Goodall Institute, we spent two months in Africa, traveling to South Africa, Rwanda, Tanzania and Ethiopia. In Africa, we had two main activities. First, we presented our films and experiences over the course of our documentation of the Loess Plateau. Second, we began to document on videotape the situation we found in each of the African countries we visited, concentrating on three areas; large degraded areas, best practices in land management and pristine natural environments. When we began to examine the situation in Africa, we found parallels in many places with the experience on the Loess Plateau. Viewing the situation through the filter of our experiences in China, helped us to see the problems of Africa in a new light and to imagine some solutions. We began our Africa mission in August in Cape Town at the Global Environment Facility (GEF) meeting. 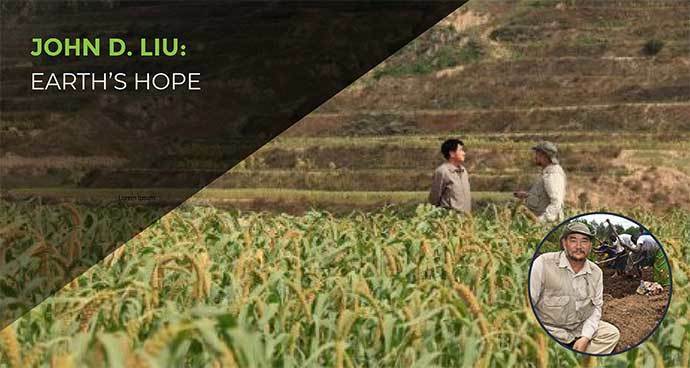 We presented the “EARTH’S HOPE” message together with video from the Loess Plateau, to assembled dignitaries and experts from around the world. I’m proud to say that the presentation was positively received. We also presented to the New Partnership for African Development (NEPAD) executive committee who also saw the value in promoting best practices and integrated strategy. Rwanda is called the land of thousand hills because of the mountainous landscape. We stayed in the Hotel des Mille Collines in Kigali, made famous by the film, “Hotel Rwanda”. Rwanda is struggling with the aftermaths of genocide and one of the fastest growing populations in the world. Although one cannot help but be touched by a profound sadness that permeates Rwanda, life must go on and the people are working hard to emerge from their collective tragedy. Most of the people in Rwanda live in the countryside and try to make a living from agriculture on small plots. The growing population and lack of alternatives to small plot farming have taken a huge toll on Rwanda’s forests. Rwanda’s forest coverage is the lowest in the Central part of Africa. Everywhere throughout the country small farmers are trying to grow crops right up the sides of the hills. Given these facts, it is perhaps not surprising that we found a cycle of poverty and ecologic destruction that is further reducing the vegetation cover alarmingly. This is causing massive soil erosion, reducing fertility and disrupting the natural ability of rainwater to infiltrate and be absorbed by the soil and the plants. Without this natural absorption during the rainy season, flooding is almost inevitable. In turn, in the dry season, since the organic matter in the soil and the plants that would normally absorb and release moisture throughout the year are gone, the land is parched by human induced drought conditions. The value of natural hydrological regulation came clearly into focus for Rwandans when the water table in the highland wetlands to begin to fall. This caused a disastrous drop in the head and flow of waters used for generating hydroelectricity. The generating capacity was calculated based on the functional wetlands, the lack of water has left expensive electrical generation equipment sitting idle because the flow is insufficient to power the installed base. Downstream, the industries that rely on the electricity are cut off from the power they need and either have to run below capacity or supplement the electricity with expensive and inefficient private generators. This then hampers social and economic growth. Further ecological damage comes from erosion during the rainy season. This redistribution of soil further leaches productivity in agriculture reducing agricultural yields and income. The eroded soils are also clogging the downstream infrastructure. It is now possible to see Rwanda’s rivers running yellow, filled with sediments completely caused by human degradation. The enormity of the disruption becomes apparent when you realize that Rwanda is the home of the headwaters of the White Nile and the Congo Rivers. If these great river systems are disrupted at the source, then there will inevitably be serious downstream consequences. Our visit to Rwanda seems to have been extremely effective. When we presented the lessons of the Loess plateau in Rwanda, they listene with great interest and respect. We were able to present to the Prime Minister, to crucial cabinet ministers, to key personnel in the Ministry of Environment and Ministry of Agriculture, to scholars at the National University and other universities, to the donor community, to international NGOS, and to the press. Our thirty-minute film on the “Loess Plateau Watershed Rehabilitation Project” was repeatedly broadcast on the National Broadcasting System. Rwandans were seriously seeking answers to break the cycle of poverty and ecologic destruction. We were invited to visit and present our findings by high levels of the Rwandan government. Using what we were calling the “direct dissemination strategy” described above, we were able to rapidly bring about a consensus of understanding within the policy and implementation communities in Rwanda. Following our visit Rwanda has revised its land use policies and officially requested assistance from the World Bank, British and Chinese Governments to begin a nationwide project based on these principles. The entire country of Rwanda is only 27,000 square kilometers. In comparison the Loess Plateau is 640,000 square kilometers and the active project area of the rehabilitation was 35,000 square kilometers. For Rwandan rehabilitation to work, this new understanding, new policy and new actions, will have to protect the approximately 40 percent of Rwandan land that is unsuitable for agriculture and much more valuable as ecological land. Simultaneously Rwandan farmers will have to learn to use new crops and new techniques to intensify farming on the agricultural land in a sustainable way. And globally all of us will have to understand that our future also depends on restoring ecosystems like this and that we have a responsibility to support these efforts scientifically, technically, managerially and financially. Based on what we have seen taking place in China, the potential for rehabilitation in Rwanda is excellent. While the Loess Plateau receives only 250 – 800 millimeters of rainfall per year, the annual average in Rwanda is over 1100 millimeters and where the ecosystem has not been disrupted it receives around 1600 millimeters. Rwanda is also able to generate biomass quickly which bodes well for rehabilitation. In addition, because much of Rwanda is at higher altitude the soil organic matter more emulates soils in the temperate regions than lower lands in the tropics, which means increased Carbon fixation potential when the land is re-vegetated. Needless to say, we are very excited and hopeful about the developments in Rwanda. I first visited Tanzania at the invitation of Dr. Jane Goodall in 2002, when we made the film “JANE GOODALL – CHINA DIARY” for National Geographic. When Jane heard that we were visiting Rwanda and Ethiopia in 2006 to present the “EARTH’S HOPE” message, she asked us to include Tanzania. Through Dr. Goodall’s connections we were invited by the Vice President’s office at the President’s request. The Executive Director of the Jane Goodall Institute in Tanzania was instrumental in helping us arrange our presentations and in filming a cross section of ecosystems in Tanzania. Compared to Rwanda, Tanzania is a very big country. Tanzanians are rightly proud of the national parks and game reserves that protect approximately one third of Tanzanian territory and are home to an estimated twenty percent of Africa’s large mammal population. While the land inside the National Parks and protected areas that entice high paying tourist on safari is well cared for, large areas of Tanzania, where people are living is rapidly deteriorating. As in Rwanda, ecologic damage is causing the water table to drop. Again this affects hydroelectric generation and is reducing the amount of energy available for Tanzania to develop. What we saw was growing competition for scarce land resources. Much of Tanzania was traditionally savannah or grasslands. Traditional pastoralists want to continue their way of life but when they increase the size of their herds with no increase in land this puts undue strain on the land. At the same time, land is being shifted to cultivation or non-agricultural uses increasing the stress. Something’s got to give. What we learned in our documentation of the Loess Plateau rehabilitation was that, designating ecological land didn’t mean protecting land hundreds of kilometers away in a national park. It meant that ecological land is needed everywhere. Each watershed needs to be analyzed individually and from top to bottom optimized for ecosystem function. By protecting land for its ecologic functionality you are also improving the fertility, moisture, and stability of the economic land. In Tanzania, we presented “EARTH’S HOPE” a number of times to the Vice President’s office, other Tanzania government officials, scholars, activists, development professionals and the press. We also reached the entire country via television. Not only did the Tanzanian National Broadcaster repeatedly air the 30-minute film on the Loess Plateau Watershed Rehabilitation Project but I was also gave a 30-minute interview which was broadcast nationwide. We did our best in Tanzania to communicate rapidly the importance of this information. We hope that it has sparked continuing discussion and research that will help this important African nation to protect its natural resources and help raise its people from poverty. Hosted by the “Productivity Safety Net Project” and the World Bank, we traveled from Tanzania to Ethiopia for the last leg of our 2006 Africa trip. We found Ethiopia to be something of a paradox. While it has large, entrenched ecological problems and widespread poverty, it also has tremendous potential for rehabilitation. Ethiopia is an ancient country and the cycle of poverty and ecological destruction is very well known there. Ethiopia has long received foreign assistance, often as humanitarian food assistance. This strategy has in large part failed, as over this same period Ethiopia’s population has tripled and the level of land degradation has increased, so Ethiopia is now further away from being able to feed its people than it was before. According to the President of Ethiopia the tree cover is below 3 percent in a land that traditionally was forested. Ethiopia has been unable to feed itself. Poverty is widespread and as noted before famine is only averted by annual shipments of food assistance that has continued for decades. There are armed conflicts with neighboring countries, deep distrust among the political elite, and a string of failed development attempts. From a socio-economic perspective, based on current trends and traditional criteria, Ethiopia seems mired in problems. Interestingly, when contemplated from the perspective of what has been learned in the Loess Plateau, Ethiopia seems like an enormous opportunity. The criteria for rehabilitation are really excellent in Ethiopia. In some ways there is greater potential for rehabilitation in Ethiopia than in the Loess Plateau. There is for instance sufficient rainfall in Ethiopia, from 500 to 1500 mm per year, compared with 250 to 800 mm per year in the Loess Plateau. There is the enormous potential to generate biomass that comes from Ethiopia’s location in the low latitudes near the equator. There is even very favorable Carbon sequestration potential in the higher elevations because the decay of organic matter is relatively slow for the tropics given the high altitude. Perhaps most favorable is that there is already sufficient funding for large-scale ecosystem rehabilitation going to the country through multi-donor strategies like “The Productivity Safety Net Programme”. The funds go to pay poor Ethiopians for their labor. If that labor were directed in integrated poverty eradication and large-scale ecosystem rehabilitation there is every reason to believe that it would work. Already innovative solutions have been tried in isolated pilot areas and have proven successful. Examples of community based integrated watershed management led by well-trained leaders are showing the way. Multi-story cropping providing diverse, high yield, high value harvests at various times in the year are showing how to replace unsustainable grain production. Cut and carry fodder systems that increase animal yields without allowing them to decimate the vegetation cover have proven successful in Ethiopia. And when fundamentally degraded areas have been set aside they have returned through natural succession to completely functional forest ecosystems. When these efforts are joined up and this is applied to the entire country then there is most definitely hope for Ethiopia. In December 2006, I was asked by the Dutch Government to return to Addis Ababa to present to the Horn of Africa Regional Environmental Network, serving Djibouti, Eritrea, Ethiopia, Kenya, Somalia and Sudan. Presenting to environmental experts and academic leaders from the front line of sub-Saharan desertification was one of the most satisfying presentations I have made so far. In this region, where ecological collapse is well known and where many people face armed conflict on a daily basis, it was possible to reach collective understanding and consensus in support of the “EARTH’S HOPE” thesis. This suggests that the strength of this idea could help bring peoples together to heal more than the just physical wounds we have inflicted on the Earth over the generations. We need to contemplate what is at stake and the scale of what needs to be done. There are now 6.5 billion people on the Earth and we are adding one billion people every twelve years. That means that in 12 years from now there will be 7.5 billion, in 24 years there will be 8.5 billion and in 36 years there will be 9.5 billion people, unless current trends change. It is clear that humanity is going to have to make collective decisions on a global scale in order to survive. To have any realistic hope for the future, we need a global vision, which everyone can understand and agree with to, fundamentally address the ecological problems we face, return humanity to some sort of equilibrium with the planet, and finally, end the cycle of poverty and ecological destruction, once and for all. Perhaps it’s a good thing that in order to do this we will have to overcome racism and conflict. The Loess Plateau Watershed Rehabilitation is providing a functional model for integrated poverty eradication and large-scale ecosystem rehabilitation which explains the scientific basis for rehabilitation, while simultaneously defining the role and responsibility of those who live in poverty, at the edges of large degraded ecosystems, and, the role and responsibility of those living in wealth far away. Remarkably, the interests of both groups are the same. Both require, that the ecosystems degraded by human beings over millennia be restored, in order to survive in the long run. It’s difficult but necessary to contemplate the size of these thoughts. The scale needed to succeed means that all degraded land which can be restored everywhere on earth needs to be rehabilitated. The shared responsibility and the degree of difficulty require the participation of people all over the world. If this isn’t done, then the current trends of increased population, declining biodiversity, growing deserts, reduced natural fertility and productivity, disrupted fresh water supplies and massive Carbon disequilibrium, will ultimately cause modern civilization to fail. But if the understanding emerging from the Loess Plateau and the actions that this understanding demands, are implemented globally, then we have a chance to correct the fundamental imbalance that has plagued humanity throughout its history. Functional ecosystems gave rise to life and are necessary for life to continue. Ecosystem degradation has local, downstream (regional) and global impacts suggesting that we must rethink the way we see our relationship with the Earth. This is an essential part of globalization. Human activity without ecological understanding leads to ecosystem collapse. Poverty and ecological destruction are interrelated. You must solve them together. The collapse of ecosystem function is linked to the collapse of civilization. It is possible to rehabilitate large-scale damaged ecosystems and restore ecosystem function that has been lost over vast areas. It is necessary to differentiate and designate ecological and economic land to ensure that there will be at least some land that is able to function ecologically. In order to restore ecosystem viability it is necessary to address the root causes of the degradation and so all unsustainable agricultural practices must end. In order for unsustainable agricultural practices to end, policies must reflect these principles, alternative livelihoods must be identified, training and investment must be provided to help transition the poorest toward sustainable behaviors. They cannot do this alone. Land tenure ensuring uninterrupted access to agricultural land for those who live near subsistence agriculture is required or they will be forced to devastate common ecological lands to survive. Governments must understand these lessons and their policies must reflect these principles. Ecosystem function and the ecosystem benefits that accrue have not been valued by traditional economic systems and so those systems are false. The survival of people who live in or near large degraded ecosystems and the survival of people who live in wealth far from these places in the developed world, are both dependent on restoring viability to large ecosystems that have been disrupted or destroyed by human activity. Learning these lessons will ensure that future generations will enjoy rushing rivers, forests, wildlife and more efficient, productive farms, as well as living in peace and prosperity. We need to understand what is at stake. History provides strong, compelling evidence that ignoring these lessons will lead to ecosystem collapse and the end of our civilization. When we look toward the future do we see growing deserts, more people living lives of desperation and poverty, or do we see forests, rivers, healthy and wealthy people with a sustainable future? These are two different paradigms. When we achieve the second paradigm the entire dynamic changes. This is exactly what is needed now to address climate change, poverty, and ecosystem health. The lessons of the Loess Plateau help to illustrate a sustainable future for humanity and represent “EARTH’S HOPE”.